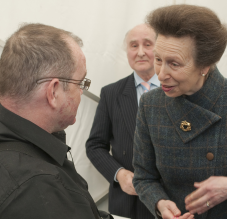 HRH The Princess Royal opened a new service designed to empower people with learning disabilities to live independently within the community in Knowle in South Bristol recently. The development, run by learning disability charity Hft, offers 9 self-contained flats over three floors with a communal garden and 24-hour care and support for up to 9 people. On Monday [28 April] the Princess Royal (pictured with a resident) was given a tour of the property and gave a speech commenting on the positive impact of technology to enable people to increase their independence. In her speech, the Princess Royal highlighted the importance of voluntary income to ensure its wider implementation to enable people with learning disabilities to achieve their goals, and signed a commemorative guestbook to mark the opening. The Princess also listened to a series of presentations. These focused on the flexibility of the building design which lends itself to the installation of new technology in the future and how technology has supported people with learning disabilities to move into the property. Hft’s director of innovation, Steve Barnard, added: “For many years Hft has been championing the use of technology because we know the vital role it can play in empowering people with learning disabilities to get more out of life. The types of technology installed in the apartments will depend on the needs of each resident. This may include safety sensors to detect if taps are left running or the cooker is left on and pagers to enable people to call for support if needed. Each apartment will also have a wall mounted G9 hands free touch screen monitor supplied by Green Access. Features of the system include specialist reminders, such as photographs or audio cues, to act as prompts to complete tasks or to take medication. It also provides security and fire alarm monitoring facilities for smoke and heat detectors. If activated a member of staff will be immediately contacted via their smartphone and will be able to give face to face reassurance. There is also the opportunity for future provision to be installed including video entry and facilities such as Skype to call friends and family. Hft currently supports 25 people within Bristol and Bath and over the next few years, like with all Hft services, will be looking to support people of all levels of need to live within their own homes with the support that they need.